This school year, develop skills and proficiency and empower the teachers and leaders in your school with SSAT Coaching. Coaching is proven to improve performance and add to the portfolio of tools needed to drive improvement and secure the best possible outcomes for students. embed a culture of coaching. Whatever your context, phase of education or career stage, your SSAT Coach will provide a series of powerful one to one coaching sessions designed to unlock your potential and that of your staff. SSAT is the leading national provider of training and development for school leaders at all stages. We are immensely proud of our reputation for excellence and of our thousands of leadership alumni who inspire and impact children and young people every day. SSAT one-to-one coaching targets those in any middle and senior leadership roles including Headteachers, Principals, Executive Heads and CEOs. You’ll benefit from dedicated time with an experienced external SSAT Coach who will quickly build a strong rapport with you or your selected staff. Using a wide range of expertise, your SSAT Coach will objectively and confidentially help you to tackle challenging and sensitive issues and consider exciting future possibilities to positively impact on your priority areas. SSAT Coaching provides support, challenge and opportunity to explore your issues and goals and will help you to formulate effective action plans. Sessions can be flexibly arranged with timings to suit the individual. Talk to us about our telephone, Skype or face to face coaching options. We can help you embed a culture of coaching in your school, MAT or local authority by providing SSAT Coaching training for senior and/or middle leaders in your school. Our high-quality training is suitable for individuals with some or no experience of coaching at all. Choose from full or half day sessions or training over a series of twilights. All our sessions are designed to give participants the opportunity to explore the benefits of coaching and acquire the skills, knowledge and understanding to confidently carry out their roles while developing others, leading change and sustaining improvements. reflect on the next steps for coaching in your role and your school. 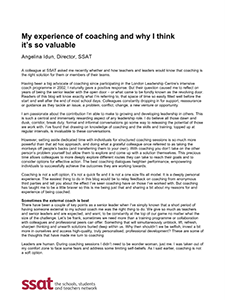 a clear vision for coaching in the organisation. Are you interested in what coaching could do for you, your staff, school, LA or MAT but can’t find what you need on these pages? Contact us at adviseme@ssatuk.co.uk or register your interest.